Rey Francisco (Guadalupe) Sanchez was born on October 5, 1967 in Rio Piedras, Puerto Rico. 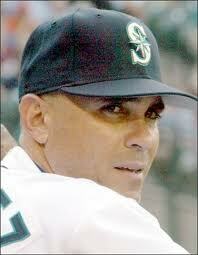 Sanchez attended high school in Morgan Hill, California where he was signed by the Texas Rangers in 1986. He played in the Rangers minor league system throughout the 1980's missing & missing the entire 1990 season due to injury. 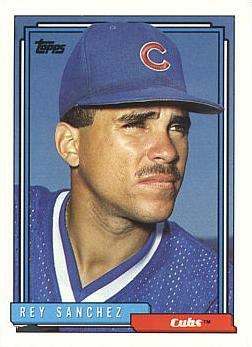 Sanchez was traded to the Chicago Cubs in 1990 & played there from 1991 into the 1997 season. He was the back up to both; Shawon Dunston at short stop filling, as well as playing behind Hall of Famer Ryne Sandberg at second base. 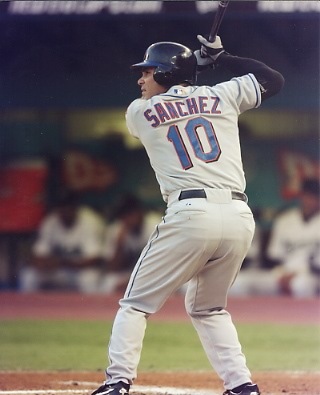 Sanchez would bat over .280 twice in Chicago getting into 90 games four straight seasons (1993-1996). In 1996 he posted a .977 fielding % (3rd best in the NL). The next season he was traded to the A.L. New York club for a minor leaguer. There he hit .312 in just 38 games & made the post season seeing action in the 1997 ALDS. Sanchez went to the San Francisco Giants from there, where he hit .285 in 109 games. He then moved on the Kansas City Royals for three seasons where he became the Royals regular short stop. In 1999 he had one of his best seasons batting .294, with 10 sac hits (7th in the AL) 18 doubles 6 triples & a career high 56 RBIs. At short he posted a .982 fielding % (3rd in the AL) making 242 put outs (3rd in the AL) & 452 assists (4th in the AL). In 2001 he was batting over .300 after playing in 100 games for Kansas City when he was sent to the Atlanta Braves for the stretch run, when Rafael Furcal got injured. Sanchez got to play in the post season again, losing to the eventual world champion Arizona Diamondbacks in the NLCS. In 2002 he signed with the Boston Red Sox and led all AL second basemen in fielding (.991%) while batting .286 in 107 games. In the off season he signed on with the New York Mets for the 2003 season. 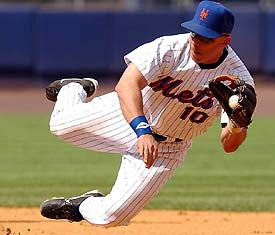 He began the year as the team’s main short stop replacing Rey Ordonez. He was to bridge the gap until Jose Reyes was brought up & ready for the big leagues. Sanchez was the opening day short stop & although he got no hits that day he drove in a run in the Mets loss to the Cubs. Sanchez would only play in 56 games for the Mets batting just .207 in a short lived disaster of a stay in Queens. Drama: During the Mets' trip to Puerto Rico, Sanchez publicly blamed pitcher Jae Seo for a bad throw to second base when Sanchez was late covering the bag. Two days later, he refused to talk to reporters after making a crucial error in a game. The final straw was when pitcher Mike Stanton claimed he saw Sanchez getting a haircut in the club house during a blow out game. Stanton reported it privately & the next thing you knew it was being broadcast on ESPN radio. Sanchez denied the charges "It didn't happen," he said. "It didn't happen at all." The Mets held a team meeting & Manager Art Howe said the matter was taken care of internally. In any event Sanchez was quickly traded to the Seattle Mariners on July 29th for Kenny Kelly who never played a game for the Mets. Sanchez went to Tampa in 2004 & then back to the A.L. New York club for 23 games in 2005. In his 15 year career Sanchez hit .272 with 1317 hits 193 doubles 32 triples 15 HRs 389 RBIs 55 stolen bases & a ..308 on base % in 1490 games. In 984 games at short stop he had a .981 fielding %, in 480 games at second base he posted a .987 fielding %.